Turn a curbside find into a fun and funky planter. Remove the seat and sand the chair to remove gloss from previous paint and to smooth out the surface. Remove fabric covering from chair seat and keep the wooden portion. If the chair you rescued doesn't have a wood seat, you may need to create one to make a frame for the planter. Trace the planter upside down on the wooden chair seat and cut a hole with a jig saw. Drill a hole in one of the corners to put the saw blade through to begin cutting. This will serve as a frame to hold the planter in place. Attach the seat with the hole to the chair with wood glue and clamp in place to dry. Paint the entire chair with Krylon® ColorMaster™ Primer in White. Let dry. Paint the entire chair with Krylon® ColorMaster™in Bauhaus Gold. Let dry. Wash the planter with Dawn dish liquid and set aside to dry. Once dry wipe down throughly with alcohol. Paint the planter with Krylon Primer for Plastic in White. Let dry 10 minutes. 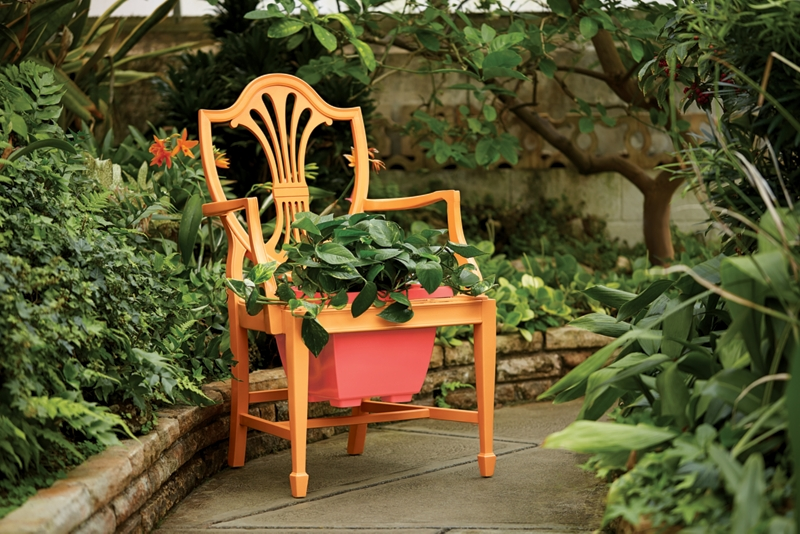 Paint the planter with Krylon® ColorMaster™in Coral Isle. Let dry throughly.